A brand new business has begun to sell its own brand of silicone oven gloves on Amazon.com in the USA. SHROGS have been toiling away hard in order for their gloves to be available for the upcoming hotter summer months and the predicted rush for BBQ tools and equipment. 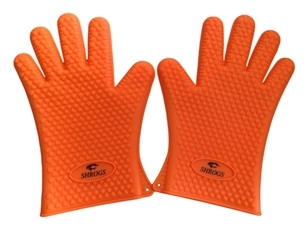 Although there are numerous different styles and types of oven gloves that customers can purchase, SHROGS wanted to put their whole efforts into manufacturing gloves made of food grade silicone because they have many advantages over the other types of gloves that are available. Keane pointed out that Amazon.com was selected as their primary outlet to begin its ventures because its reputation and standing is second to none and customers can trust the excellent customer service and delivery times. SHROGS will benefit from the great potential amount of customers that use Amazon.com as their first online shopping destination. Keane wanted to stress that in due course, many other outlets will be selling SHROGS products. Mark Keane, uncompromising when it comes to customer satisfaction said, “We love getting comments from customers like Seraphina. At the moment we are a small company but getting wonderful comments like that will help us grow in the future. We will be giving superb customer service and guarantee”. “SHROGS is an abbreviation silicone heat resistant oven gloves, simply take the first letter of each word.” Mark Keane said of the name. “We wanted to keep the name short and catchy so that it would be easily remembered, such as “pass us the SHROGS””. Apart from their initial product launch of their gloves made from food grade silicone, this is only the start. Mark Keane, the public relations manager wanted to point out, “There are many more exciting products that we are looking into to develop, not only in the oven gloves and mitts department but many other niches too. Food grade silicone is an amazing product and we want to take advantage of it”. Copyright © 2019 Silicone Oven BBQ Gloves. Powered by WordPress. Theme: Spacious by ThemeGrill.